Novabase is a Portugese IT services firm that also hold subsidiaries that run a ticketing system and German direct TV, they also run a venture capital fund. They state that their goal as a company is to make people's lives simpler and happier through the use of technology. Novabase is a company that appeared in my list of cheap profitable stocks I posted about here, and I wanted to dig in deeper to see if this was an opportunity. I first off need to apologize because Novabase isn't in fact a net-net as I made it out to be in the Cheap in Portugal post. The cause of my mistake is I used the line capital shares as the number of shares, I pulled this from the annual reports. As I dug further I realized capital shares is subscribed capital, something we don't have much of in the US because most companies issue stock with a par value of $.01. I should also mention, I couldn't find the share count in any of the annual reports, I pulled the number of shares I use from Bloomberg and FT.com, which was 31,401,000. While Novabase isn't as cheap as I originally thought on a asset basis I still believe they offer a relatively good value on an earnings basis, I detail why below. IMS: Integration services, network infrastructure, ticketing system. The venture fund is partially funded by the EU ERDF regional development fund. The ERDF is a development initiative of the EU to stimulate local regions by investing in companies in the area. Novabase runs a venture fund that has about five investments from what I can tell. The nice aspect of the EU as an investor is most likely the EU won't run to pull their money out at the first whiff of trouble, they are a long term investor. Investments in the fund include home automation, telecom firm, media analysis and business intelligence, two CRM companies. The digital TV segment is interesting, prior to 2008 the German digital TV division was consolidated along with the rest of their earnings, but in 2008 it appears they disposed of enough of the company to unconsolidate the financial statements. This is a good development from a business perspective while the German TV division brought in a lot of revenue it wasn't really profitable, and was a drag on earnings. For the financial statements I developed below I took out the German TV segment prior to 2008, Novabase breaks this out in their statements as well. One thing I appreciate is that Novabase breaks out all of it's income into segments and reports on those segments. There is a lot more detail in the annual reports, but I wanted to highlight revenue, and EBITDA by segment. What the breakdown by segment shows is that the Consulting and Venture Capital segments are have a much smaller cost structure than IMS and Digital TV. The second aspect is that it shows the Venture Capital fund isn't a huge part of their business, some investors might get a bit frightened seeing a venture capital fund as part of an IT services business, but if anything it looks like a sweetener not something to worry about. The last thing the breakdown shows is that 79% of revenue, and 88% of EBITDA comes from IT services which is their core line of business. -15% of revenue is international, the international segment is growing at 20% a year. -The financial statements are excellent, very transparent, and available in English through the CMVM. -Novabase has positive retained earnings, and has been consistently profitable even in this tough environment. -The company has issued guidance for 2011 of €245m in revenue with €20-22m EBITDA, this is in line with their 2010 results. -Novabase's balance sheet accruals ratio is 1.2% which is excellent, higher accrual ratios indicate lower quality earnings. With any stock trading at a low valuation I think it's important to examine possible reasons for the cheapness. Here are a few reasons I identified. -It's a very small company with a 98m euro market cap. -The company derives most of it's revenue from Portugal which is in turmoil currently. -The company strongly identified with it's German direct TV business which was a large drag on earnings. -The earnings are not stellar, or growing like crazy, but they are undervalued. -The stock is down significantly in the past year, momentum rules in the short term. -Net income and revenue were growing nicely up to 2008 but have stagnated since. 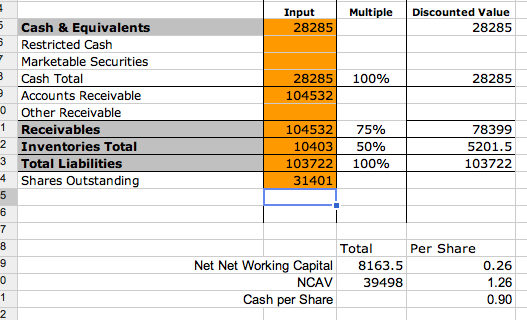 When I first approached this I thought it was a net-net so I put the figures into my net-net worksheet, although it isn't trading at a discount to NCAV it provides a nice read on the balance sheet. 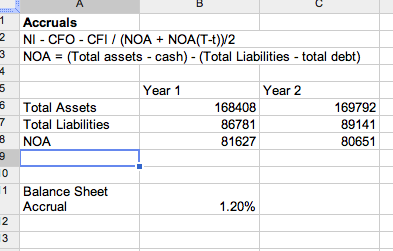 Here is my breakdown of the income statement elements for the past five years. To value the common if we take the .90 in cash and add earnings at a 10x multiple we get €5. Using the more common average multiple of 15x we get €7.05. -In 2010 the company reported the highest net profit ever, are margins at peak? -There is significant margin shrinkage in the digital tv area of business. -Cash flow statements aren't published, they need to be constructed by the investor. -The company has 10.472m of debt for a approx 10% debt to equity ratio. -The company also has lease obligations 1.67m per annum. -Most of the business is in Portugal which has one of the lowest high school graduation rates in the EU, along with a stagnating business environment. Hi Nate, interesting company. Do you know why the stock went down since 2000 until beginning 2008? I believe a large reason is that they owned a German TV station which provided a ton of revenue but was a drag on earnings actually causing a loss for a few years before they sold it. The CMVM filings are in English and have annual reports going back a number of years. When I was researching this stock I picked the 2004 annual report and read forward. Dumping the TV business was a good move but the market never recognized it. Novabase dumped the TV division around the same time as the financial crisis. Since this post they have reported quarterly earnings again which were lower than expected and the reason for the slow drift downward. On the plus side international revenue jumped, I'm still long Novabase. Hi Nate,after a few years the company is very different but, in my opinion, still very interesting.